You all know I have this thing against made up beer styles. They appeal to me about as much as flavoured porters. I don't like change. Perhaps Mark Twain was referring to me when he penned his famous change quote. It might have been my family that bought me this beer. My little one picks bottles based upon labels; she might have thought this beer was a Disney tie-in. 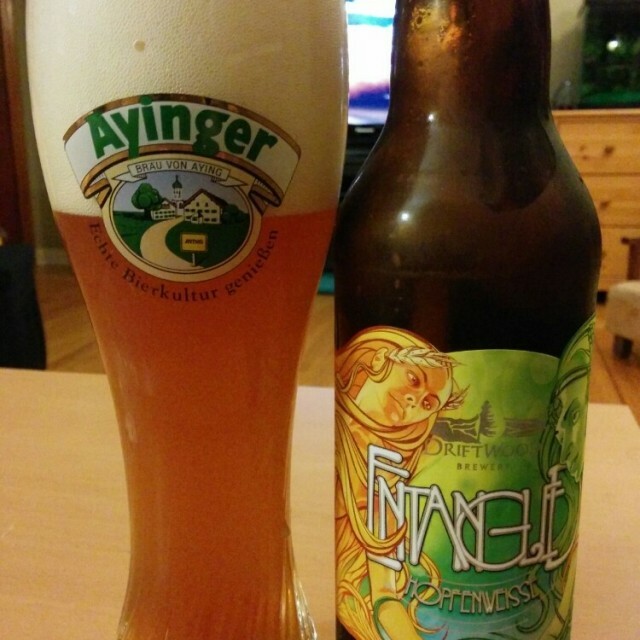 Entangled is a hopfenweisse or hoppy wheat beer. Let's call this beer Fat Tug Wheat or FTW for short. I can see why she was attracted to the label. My choice for best packaged beer of 2014 was just decided. Those Hired Guns kids make some elegant designs. Anyways, back to the Fat Tug theme. Last month we sampled Fat Tug lite. Perhaps Driftwood might do a Fat Tug Black, a.k.a. American-style Black Ale/Cascadian/ Black IPA. This I could get behind; might even buy more than one. Enough of my rambling, how does the FTW taste? Those who buy too much beer will find similarities between FTW and the Brooklyn/Schneider collaboration beer. Both smelled of potency in the spicy, floral, citrus hop department. There was not a lot of wheat in the nose, just the hops. Wheat became noticeable in the sip, it tempered the anticipated IPA astringency with a tongue caressing creamy texture. Most beer drinkers in Victoria have a collection of dedicated brain cells responsible for recognizing the taste of Fat Tug. Imagine this flavour mixed with cream of wheat and bread. The ending was the expected long linger of spicy wheat and citrus. I'm starting to warm up to the idea of made up beer styles. Glassware: Should be a weisse glass. Food pairings: Hard with fusion beers; perhaps fusion food is in order. Try this next to a breaded salmon with lemon glaze. I might ask for a lemon and Seville orange risotto. Cellar: Nope, it's all about the fresh hops. Cheese: This is a new category. 2015 will be the year of cheese. An aged sheep's cheese, sharp cheddar or aged Gloucester should have enough strength to balance this potent beer.